Sushi is a delicious cuisine that originated in Japan and is now enjoyed worldwide. Sushi is normally made with raw seafood and cold rice. However, some seafood is cooked before being rolled up in the seaweed to become a sushi roll. Tempura is a Japanese way of frying food in a heavy flour batter. Some restaurants and chefs are now frying sushi rolls in tempura batter to create a new spin on sushi. The crunchy warm sushi can be enjoyed even by the staunchest sushi purists. Create a tempura batter. Mix the egg, flour and one cup of ice cold water. You can include a few ice cubes in the cold water. Lightly beat the batter. You do not want to mix too thoroughly. This batter should be used right away after mixing. Prepare your sushi rolls. Purchase or make thin sushi rolls cut into half instead of the traditional six pieces. 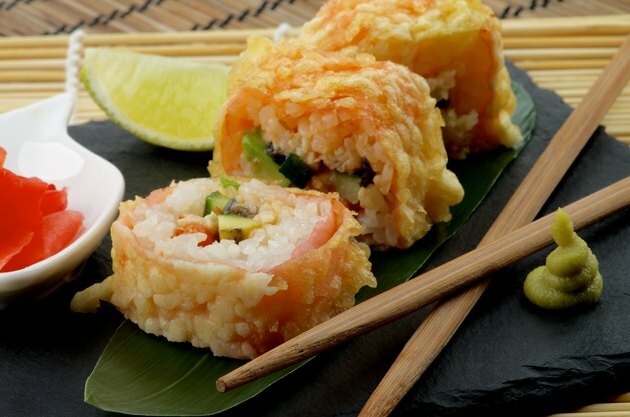 Place your sushi rolls in the refrigerator for five minutes prior to frying. Lightly dust with potato or rice flour before frying. Heat 1 inch of cooking oil in a heavy skillet over medium-high heat. The oil should be very hot so that the sushi rolls will fry immediately. Dredge the sushi roll through the tempura batter coating all sides evenly and covering the roll completely. Place your sushi roll in the hot oil until the outside is crispy and brown, about three minutes. Turn once to cook evenly. Place the sushi rolls on a paper towel when cooked to soak up any remaining oil. Cut into small pieces and serve immediately.